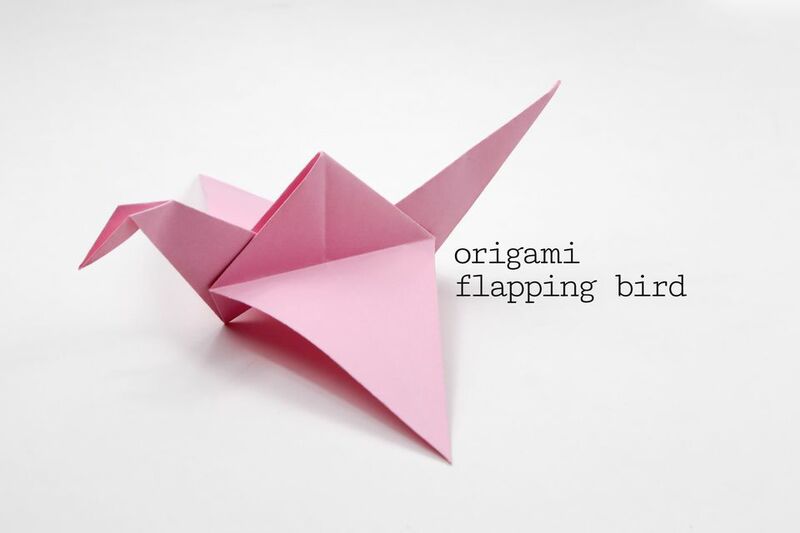 Learn how to make a cool origami bird with flapping wings! Looks similar to an origami crane, makes a great party trick. You'll need one sheet of square paper for this, for best results use thin but sturdy paper, if you have some standard origami paper, that will be fine, use size 15 x 15 cm for a good result. Our paper was 20 x 20 cm for the tutorial, but made the flapping less effective! 1. Start white side up. Fold the paper diagonally in half both ways and unfold. 2. Fold the paper in half top to bottom, left to right and unfold. 3. Rotate the paper and grab the left and right corners. 4. Bring the corners forward and down, flattening the top corner on top. 6. Fold the left and right edges to the center as shown. 7. Reverse inside fold the last folds. 8. This is the result. 9. Flip the paper over left to right, repeat the last folds. 10. Lift the top layer to the top. 11. Do the same on the back; this is what it should look like. 12. Fold the Front flap in half, same on the back, like turning the pages of a book. 13. This is what you should now have. 14. Fold the flap up as far as it will go. 15. Repeat on the back. 16. You should have this triangle. 17. Pull out the head from the inside. 18. Now pull out the tail to where it looks nice to you. 19. Shape the head by reverse folding a section. 20. This is the result. 21. It looks like an origami crane! It's not though! Pull gently on the wings towards the head of the bird; also it helps to curve the front edge of the wing. 22. Hold the bird under its neck, gently lift the tail up and down; the wings should flap! If they don't, try shaping the wings a bit more, making sure they are the same on both sides! Our bird only flapped one of its wings; we think the paper was too big and too flimsy.